A Short Biography of Congressman Staggers, Sr.
Harley Orrin Staggers, Sr. was born August 3, 1907 on a farm outside of Keyser, West Virginia. Mr. Staggers attended public school in Mineral County, West Virginia. During his school years, Mr. Staggers worked a variety of jobs in the evenings and during summer breaks. These included working in a silk mill, on the Baltimore and Ohio Railroad, in wheat fields throughout the Midwest, and in a rubber factory in Ohio. Harley Staggers received a BA degree from Emory and Henry College in 1931 and went on the carry out graduate work at Duke University. He was later awarded an honorary Doctor of Law Degree from Davis and Elkins College, West Virginia University, and West Virginia Wesleyan College. He also received an honorary Doctor of Science Degree from West Virginia School of Osteopathic Medicine. Prior to his career in public service, Harley Staggers taught science and coached for a Virginia high school and later coached football at Potomac State College in Keyser. Mr. Staggers was elected Sheriff of Mineral County in 1937 and served in that position until 1941. Mr. Staggers also held the position of Right of War Agent for the West Virginia State Road Commission in 1941 and became the West Virginia State Director for the US Office of Government Reports in 1942. During World War II, Harley Staggers served as a navigator in the US Naval Air Corps, rising to the rank of Lieutenant Commander. In 1948, Harley Staggers was elected as a Democrat to the United States House of Representatives, serving West Virginia’s 2nd District. He would be reelected to 15 terms in Congress, serving a total of 32 years from 1949-1981. 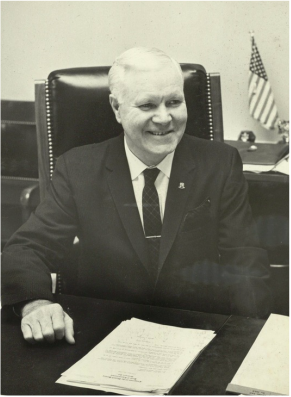 Congressman Staggers served as an Assistant Whip in the U.S. House of Representatives from 1955 to 1977 and served on the House Committee of Veterans Affairs, Post Office and Civil Service, and the Interstate and Foreign Commerce Committees. In 1966, Congressman Staggers was elected chairman of the House Interstate and Foreign Commerce Committee. He led the committee through the next 15 years until his retirement in 1981. Congressman Staggers was credited by many economists for saving the declining railroad industry in the United States through the passage of the Staggers Rail Act in 1980, which allowed for wide-scale deregulation of railroads. He is also credited with preserving national railroad passenger services and improving the working conditions of railroad employees. Congressman Staggers was active in his church and home community of Keyser, West Virginia. He taught Sunday School as a member of the United Methodist Church. He held the position of President of the West Virginia State Moose Association and District Governor of the West Virginia Lions Clubs. Congressman Staggers was also a member of many community groups such as the American Legion, VFW, Mineral County Chamber of Commerce, and the West Virginia Farm Bureau. Congressman Staggers died at the age of 84 on August 20, 1991 of congestive heart and respiratory failure at Sacred Heart Hospital in Cumberland, Maryland. Congressman Staggers, Sr. was married to Mary Veronica Casey Staggers (July 3, 1915 – May 4, 2000) and had four daughters and two sons. Harley O. Staggers, Jr. served five terms in the United States House of Representatives from 1983 to 1993 (his papers are also housed at the Byrd CLS) and his daughter Margaret Ann Staggers has served in the West Virginia House of Delegates since 2007. STAGGERS, Harley Orrin, (father of Harley Orrin Staggers, Jr.), a Representative from West Virginia; born in Keyser, Mineral County, W.Va., August 3, 1907; attended the public schools of Mineral County, W.Va.; was graduated from Emory and Henry College, Emory, Va., in 1931; graduate work at Duke University in 1935; coach and teacher of science at Norton (Va.) High School 1931-1933; head coach of Potomac State College, Keyser, W.Va., 1933-1935; sheriff of Mineral County, W.Va., 1937-1941; right-of-way agent, State Road Commission of West Virginia, in 1941 and 1942; West Virginia State Director, Office of Government Reports (later Office of War Information) in 1942; lieutenant commander in the United States Naval Air Corps with service as a navigator in the Atlantic and Pacific Theaters of War 1942-1946; elected as a Democrat to the Eighty-first and to the fifteen succeeding Congresses (January 3, 1949-January 3, 1981); chairman, Committee on Interstate and Foreign Commerce (Eighty-ninth through Ninety-sixth Congresses); was not a candidate for reelection in 1980 to the Ninety-seventh Congress; was a resident of Keyser, W.Va., until his death in Cumberland, Md., on August 20, 1991.